The Kingy The historic Kingscliff Beach Hotel, affectionately known as The Kingy, was built in the 1930’s. It has over 80 years of history and today stands as a reminder of classical Australian architecture. 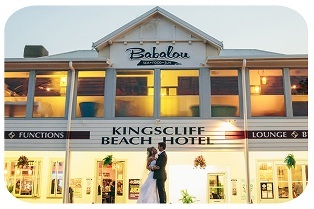 Kingscliff Beach Hotel has recently undergone an extensive re-development, which is welcoming to locals and visitors alike. The redevelopment retained the heritage character, whilst modernising the internal facilities and services, and created new family friendly spaces including an outdoor shaded beer garden and children’s playground with large trees for shade and additional car parks.